Most countries provide financial support programmes so that startups and small businesses can overcome asymmetric information in credit markets. Entrepreneurs, however, typically can only take advantage of these subsidised programmes if they enter the market themselves. Thus, entrepreneurs who market their inventions themselves are granted fiscal advantages compared to those who sell their inventions to incumbent firms. In the US, for example, the Technological Innovation Program (TIP) is one of the main programmes that promotes small businesses. It provides subsidises of up to a $3 million for the commercialisation of successful prototypes. This support scheme is available only if the business markets the product itself or is the leading company in a joint venture (OECD 2010). Similar schemes can be found in almost all OECD member states. However, our research suggests that a better policy would be to combine these subsidy schemes with policies that improve the merger and acquisition market for small entrepreneurial firms (Norbäck et al. 2018). This is because the best strategy for innovative entrepreneurs and welfare might be for entrepreneurs to make an early entry to signal invention quality and overcome asymmetric information problems. Entrepreneurs with high-quality inventions would be able to sell their innovations post-entry and receive a higher acquisition price. This would stimulate entrepreneurs to develop high-quality inventions, increasing welfare. Inventions are complex assets. The entrepreneur usually has better information about the invention quality than potential buyers or licensees. Because of the transaction costs associated with this asymmetric information problem, there is a market for lemons (Akerlof 1970), and so a risk that only bad inventions would be sold or licensed. Entrepreneurs who try to sell or license their high-quality inventions directly cannot count on receiving a higher acquisition price than their reservation price for entry, and so they retain their inventions. It is possible to overcome these asymmetric information problems if the entrepreneur makes an early entry to verify high invention quality, and then sells the innovation post-entry under bidding competition. In the product market, the quality of the invention will not only positively affect the profit of the owner, but also negatively affect the profits of non-acquiring incumbent firms. If the quality of the invention was high enough, a pre-emptive bidding war among incumbents would occur in the post-entry stage, resulting in an acquisition price significantly above the entrepreneur's reservation price. Using a detailed database on patents owned by small Swedish firms and inventors, we tested this model empirically. This database is unusual in that we have information on if, when, and how (either by entry or sale) the patent has been commercialised, but also whether the entrepreneur changed the commercialisation mode. That is, whether the entrepreneur entered the market, and sold or licensed the patent afterwards. Source: Norbäck et al. (2018). Patents that are not commercialised (Group 1) have the lowest average number of forward citations, which we interpret as being of the lowest quality. Patents for which the inventor enters the product market (Group 2) have the highest average number of average citations (highest quality). 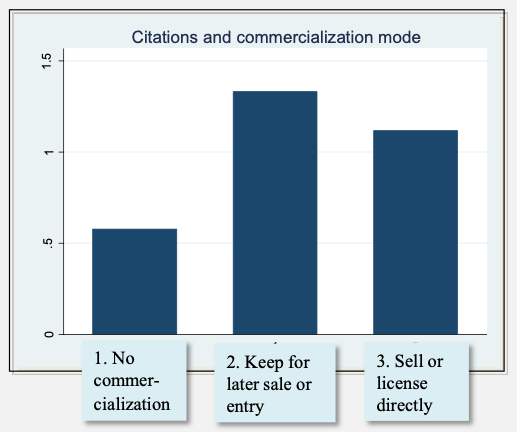 Finally, patents that are sold directly (Group 3) have an intermediate level of citations. At first glance, these observations seem to be in line with Akerlof's lemons mechanism – patents with higher quality do not seem to be sold. This reveals that the average number of forward citations in the group of patents which are sold post-entry is approximately 2.5 times larger than that of the group of patents which are kept by the entrepreneurs. 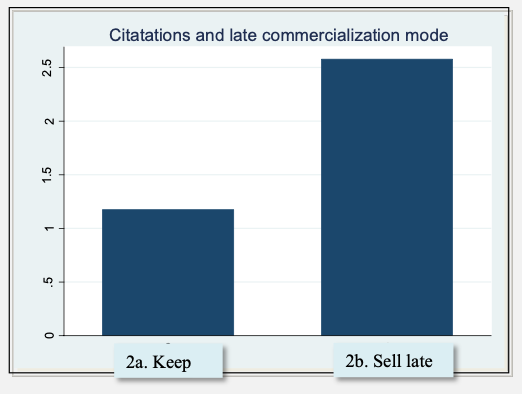 Furthermore, comparing panels reveals that the group of patents that are sold directly (Group 3) have a lower average number of forward citations than the group of patents that are sold late (Group 2b). Thus, Figure 1 indicates that entrepreneurs sell their best patents post-entry. We have done a more rigorous empirical analysis to test the entry-for-verification hypothesis and our pre-emptive bidding predictions. In the decision to sell a patent (invention) pre-entry, we find that higher entry costs promote the sale of the invention over entry, while the quality of the invention has no effect on the choice between selling the invention or entering the market. This is consistent with a lemons problem, pre-entry. When estimating the decision to sell a patent (invention) post-entry, we find that entry costs have no effect on this decision, as entry costs are sunk at this stage. However, the quality of the invention now has a positive and statistically significant effect on the decision to sell late. This result is what our model predicts when a significant share of late incumbent acquisition is pre-emptive. This suggests that an entrepreneur captures a higher share of the surplus post-entry when the invention is of high quality. The entrepreneur is paid more than the reservation price, reflecting that entry serves as a means to verify quality and generate bidding competition between incumbents. The other side of the coin is that inventors with low-quality inventions have to retain their inventions and use them to start their own mediocre, but long-run viable, firms. These results have important implications for entrepreneurs, incumbents, and welfare. Entrepreneurs with high-quality inventions have a strong incentive to enter the product market. This credibly signals the market value of their inventions. The price premium associated with high-quality inventions implies that entrepreneurs have a strong incentive to pursue risky projects that may lead to such inventions. This tends to raise overall welfare. To see why it is better that entrepreneurs pursue high-quality risk projects instead of low-quality ones, we need to understand how consumers and rival firms are affected by these choices. Note that entry by low-quality entrepreneurial firms is likely to have negative effects on more efficient incumbent firms without creating much value for consumers. Then note that, while entrepreneurs that focus on providing high-quality inventions for sale are likely to fail more often, they will create large benefits for consumers when they succeed. Thus, a shift towards high-quality, high-risk entrepreneurship is likely to increase expected welfare for society. Akerlof G A (1970), "The Market for Lemons: Quality Uncertainty and the Market Mechanism", Quarterly Journal of Economics 84(3): 488−500. Norbäck, P-J, L Persson and R Svensson (2018), "Verifying High Quality: Entry for Sale", CEPR discussion paper 13173. OECD (2010), SMEs, Entrepreneurship and Innovation,.